Delivery and Export - Evergreen Peat | UK's leading manufacturers of horticultural peat and compost products, quality continues to be pinnacle to the Evergreen ethos. 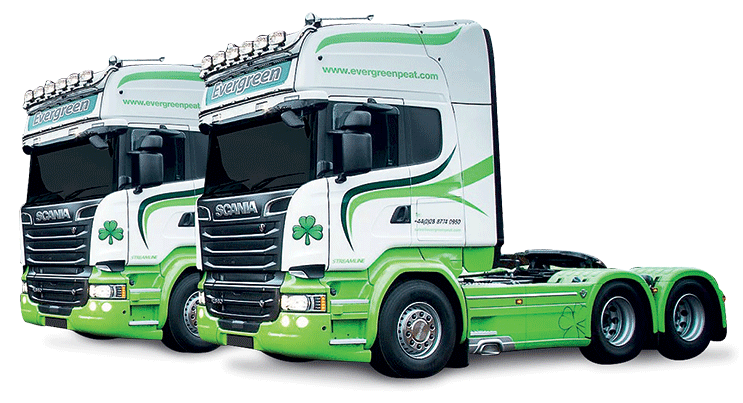 Evergreen is one of the fastest-growing horticultural manufacturers, successfully delivering & exporting our extensive range of retail products and professional substrates throughout the U.K., Ireland and worldwide. We are proud to produce best-in-class products that meet the needs of a diverse industry sector. We currently export to over 20 countries and growing, including China, Egypt, Middle East, Morocco and Turkey. Our customers understand the exceptional benefits of growing with Irish Sphagnum Moss Peat. This, combined with the latest technology in our modern factory, complemented by superior quality raw materials, enables Evergreen to produce only the finest quality growing media tailored to suit the climate and conditions of each individual customer and export market. For the home market, we have our own, branded, in-house haulage service comprised of 8 trucks & 24 trailers, working in conjunction with committed sub-contractors during busy seasonal periods. We maintain a variety of walking floor, curtain-side and flat trailers to accommodate delivery of products in both loose and bulk format. Mounty forklifts are also available upon request. Our customers have access to a live 24hr tracking system on all orders placed.